Las Vegas is an impressive city, was built in the middle of a desert, next to Indian tribes and the kilometers away from any urban center. The main features of the city are luxury, lights, colors and lots of fun. She is considered Sin City that never sleeps. There's always something to do in Vegas. If it's fun you're looking for, this is the right place. There are many attractions, enjoy the entertainment capital of the world and have fun because what happens in Las Vegas stays in Las Vegas. You can play in the big casinos, visit the luxury hotels, buy in designer shopping, watch great shows among other activities. The casinos are irresistible. We see some people playing and the stakes are impressive. Some casinos put women in lingerie teasing dancing on top of counters and table games. In most casinos in Vegas, drinks are alcoholic or non-alcoholic drinks are free and the bettor pays only the tip for the waitresses. In this post we will go over a little bit of that met during our 7 days of lodging and some tips. I will try to quote in 10 topics the main activities you can only do in Vegas. 1-take a picture on the sign "Welcome to Fabulous Las Vegas"
This is classic and one of several postcards of the city. At the beginning of the Strip, you can find the famous "Welcome to Las Vegas", welcoming to tourists, is located just south of The Strip. Take your photo there is a different memory. There is a small parking lot near the plate. Behind the plate is written: "Drive Carefully-Come Back Soon", in Portuguese: "drive carefully. Come back soon ". One of the most exciting spots of Vegas is the region known as The Strip, a stretch of Las Vegas Boulevard Avenue that has the most famous casinos and hotels of world. If you've never been to Vegas make sure you stay in a hotel in this Avenue. This is your opportunity to stay in a 5 star hotel. This, of course, fits in your budget but overall prices of hotels in Vegas are very affordable. Each hotel has a particular attraction and they all deserve a visit. The problem is that are gigantic and you can't know everything in a few days. If you are short on time to make a plan and see what suits you well, I say again, we can't know everything. We know several hotels on the Strip, including the Bellagio, Paris, New York, MGM, Luxor, Excalibur, Planet Hollywood, Mandalay Bay, Caesar's, Treasure Island, Venettian, Stratosphere, Aria and Flamingo. What is the best hotel? It's hard to say because each is more upscale than the other. We decided to break our stay getting in two different hotels. We host first in the Stratosphere, which is further away from the Strip but close to the Outlet and Fremont. Also the price was lower and who hosts this hotel has to climb the Tower included. However we wanted to stay on the Strip and also so after 3 days we went to the Flamingo. The Flamingo was the hotel on the Strip that was with the best cost benefit. Also be sure to eat at a Buffet of big hotels. You get discounts at the Tix4Tonight quioques that are scattered all over the Strip. The Tix4Tonight sells discounts to dozens of restaurants in the city. We bought our to go at the buffet of the hotel Treasure Island. We love food and we left a bit of fast foods. The Fremont Street is located north of Las Vegas, in Downtown, where Vegas was born. This place is busier with tourists during the night, because a number of live shows that are worth making out. We were there during the day and really the movement is much smaller, but we took advantage and had lunch at the famous Heart Attack Grill. More details here. The ceiling is very interesting, because it has an led video screen presenting image effects and music to accompany them. The Fremont also features hotels and casinos, but not as luxurious as the hotels on the Strip. Who has cable TV must have seen on the History Channel the Deal program (Pawn Stars). 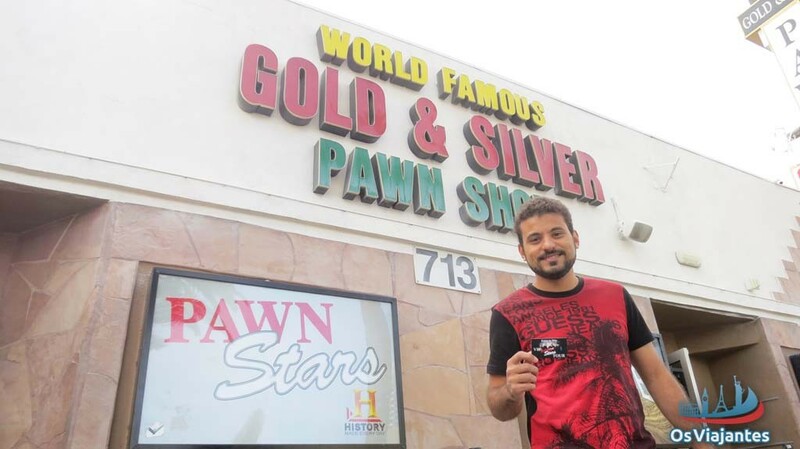 We've been in the pawnshop Gold Silver Pawn Shop & nearby the old Vegas and is the same store that is outlined in the programme. Check out this post as was our visit. The tour to the Grand Canyon can be done by various agencies coming out of Vegas by helicopter, bus and even plane. Of these the most into account is the bus, but the little I researched all said the tour is well run and there's no time to do much. Another option is to go on your own drive. There are several regions of the Grand Canyon and the closest is the Grand Canyon West. There's also the helicopter ride that is much more into account. However when we got the tickets had sold out, so we just walk in the Park. It is in this park that is the Skywalk, a glass catwalk suspended in a horseshoe shape where you can walk and have the feeling of being on top of the Grand Canyon. Check out this post more details of how the Grand Canyon West. Before arriving to the Grand Canyon we passed Hoover Dam (check out this post). The road is very quiet and very well signposted. The landscapes are wonderful. We left in the morning and arrive at night in Vegas, it was a day to take advantage of these tours. Las Vegas has hundreds of concerts and performances of different themes and styles. Has it all: adult, comedy, concerts, dance, hypnosis, illusion, magic, musicals, anyway. Are considered to be the biggest and best shows in the world. One of the most viewed are the Cirque Du Soleil. Cirque Du Soleil are really a sweet spot for a good part of the tourists who travel to Las Vegas. There are several options. At the time that we were in the shows presentation, The Beatles Love, KÀ, Mystère, Zarkana, Zumanity and Michael Jackson One. I believe we are always performing. If you want to go in a specific show, please do not hesitate to buy. Tickets can be purchased online on the site of Las Vegas or in the Cirque du Soleil site sometimes offers promotions tickets (check out always). If left to the last minute it's possible to buy tickets on the same day of the presentation. There are several kiosks of Tix4Tonight (http://www.tix4tonight.com/) scattered by Strip that sell discounted tickets for the same day, but only sell on site. What's the best show? Well, actually there is no better or worse, this is very personal. So the ideal is to search before about each show to take its decision. More detail about each can be found on the official website of the Cirque du Soleil. The fountains of the Bellagio present a spectacle that is apparent from several locations on the Strip and have an appointment: 30 in 30 minutes during the afternoon and 3:00 pm 15 minutes during the night. Very cool to see this show of dancing waters and in sync with the music. A different and wonderful spectacle. Even for those who do not like you need to try and spend at least 1 dollar playing at the Casino, after all you are in Vegas. Detail that the drinks are free for who's playing. But remember to leave a tip for the waitress to serve you again. You can view the Stratosphere Tower from anywhere in the city, because it is very high. Upstairs has an Observatory where you can see the whole city. Who hosts this hotel has the right to ticket to go to the Observatory. The Tower restaurant rotates 360 (slowly) and the person has the privilege of observing the landscape of the entire city of Las Vegas. In addition the Tower has the highest amusement park in the world. I think they're more radical toys of Vegas. Altogether there are four toys. Is an elevator that rises to the highest point of the Tower, for a few seconds and then plummets. It's a stand similar to a roller coaster but that makes a back and forth motion on the trail that is out of the tower. It seems that the car won't stop giving the impression that will fall. Are several chairs that start to rotate at a speed of 65 km/h opening at an angle of 70°. All this is of course out of the tower. And there? You see some of these? The most popular shopping malls on the Strip are The Forum Shops at Caesars Palace and Fashion Show Mall. The Forum Shops at Caesars Palace is inside the Caesars Palace Hotel Casino, considered one of the most beautiful and luxurious shopping malls of Las Vegas, owns several shops of famous brands. We visited some shops and buy some products in the Victoria's Secret store. Fashion Show Mall is characterized by a flying saucer, is across from the Wynn hotel, has several shops and restaurants. We know the malls, even not realizing a lot of shopping there, I mean that the ride was valid on such beauty and luxury. We decided to go shopping in the outlet, because the prices are cheaper. In Las Vegas there are two outlets. The Las Vegas outlets are well away from each other. Our favorite was the Outlet North. He has a larger structure, more stores with more product options and brands. The Outlet located to the North is far from the Strip and its structure is open, while the Outlet located south is closer to the Strip with a closed structure and has an air-conditioned environment. Tips: be sure to buy the book, known as "VIP Coupon Book" in the window of information. You save your money and have discounts on the purchase of products of some stores. You can also print your discount book for free. Visit the site Premium Outlets and make a record. Remember that you can only use a coupon, note which one has the best discount. We found several Ross stores throughout the city of Las Vegas. The store features merchandise from past collections and products discarded by big stores, with clothes, shoes, linens, glasses, watches among others. The best time to shop is in the morning, as soon as they open, because the store is more organized. South Las Vegas, 3771 Las Vegas Blvd (huge). Macy's is a department store that sells various products with good prices. There is a store in the 3200 Las Vegas Blvd address which is across from the Wynn Hotel. In addition to clothing, the store has perfumes, cosmetics, handbags. A good tip is that Macy's offers foreigners a card that gives you a good discount on your purchases. To get it you simply present your passport next to the "Guest Relations". The card is valid for 30 days and is available in the same site, it's interesting that you print it. Walmart is a supermarket chain that besides selling food, you can buy cosmetics, electronics, clothes … The prices are excellent. We did some shopping at Walmart, mainly for beauty products. We realized that we had forgotten some products at the supermarket, that a day later, imagine my despair. And here we go back to the same Walmart. We're looking for call center, talked to the attendant and present the coupon. We are waiting for a few minutes, then she asked we loaded the products that we had forgotten. And of course we bought more products. We were very satisfied. This Walmart is huge, far from the Strip, we drove. And these were the 10 things you can only do in Las Vegas in our opinion. And you? Have you ever been to Vegas? Leave your tips in the comments.